NEW YORK CITY ( January 22, 2015) — The Nashville-based communications firms of DVL Public Relations & Advertising and Seigenthaler Public Relations, Inc., will merge and be acquired by global agency, Finn Partners, it was announced today. 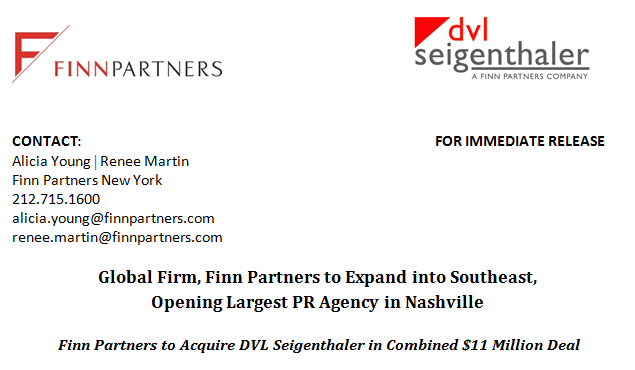 The new combined agency will be known as DVL Seigenthaler, a Finn Partners Company and it will be the biggest public relations agency in Nashville and in the state of Tennessee, and one of the largest public relations firms in the southeastern US. Together the combined operation will have annual fees of approximately $11 million with a staff of 80. This acquisition will bring Finn Partners annualized fees to approximately $65 million, its total number of employees to 450 and its number of offices to 12. Beth Seigenthaler Courtney, CEO of Seigenthaler PR, has been named a “Woman of Achievement” by the Nashville YWCA; and a “Woman of Influence” by Nashville Business Journal. Beth has also been recognized as one of Nashville’s most powerful by Nashville Post magazine. Beth serves on the boards of directors of Boys & Girls Clubs of Middle Tennessee, Nashville Convention and Visitors’ Corporation, Nashville Public Radio, Parthenon Conservancy, Southern Alliance for Clean Energy, Tennessee Performing Arts Center and the Women’s Fund. Beth has also been named “Outstanding Volunteer of the Year” by the Nashville Chamber of Commerce. Ronald Roberts, CEO of DVL, is on the Board of Directors for Citizens Bank & Trust, the Nashville Sports Council, Second Harvest Food Bank, Downtown Nashville Rotary Club, Downtown Partnership and the 100 Black Men of Middle Tennessee. He also serves as the Vice Chairman, Board of Professional Advisors for Middle Tennessee State University’s College of Mass Communications as well as on the Public Relations Advisory Board for Belmont University. He is a Deacon at Lake Providence Missionary Baptist Church. Beth Courtney will serve as President and Ronald Roberts will serve as CEO of DVL Seigenthaler. They will report to Richard Funess, Senior Managing Partner of Finn Partners. DVL, whose capabilities include advertising in addition to PR, is particularly strong in the Digital/Creative area, with over 15 staff members specialized in this sector. Both the DVL and the Seigenthaler Digital/Creative staff will join the rapidly growing Finn Partners Digital team. With these acquisitions, the Finn Partners Digital/Creative group will have a combined staff of approximately 50 people. DVL and Seigenthaler clients include Airbus DS Communications, AMSURG, Bridgestone Americas, Inc., Brown Forman, Electronic Recyclers International, Goodwill Industries of Middle Tennessee, JM Smucker Co., LifePoint Hospitals, Inc., the Metropolitan Nashville Airport Authority, Nashville Electric Service, Natural Resources Defense Council, Regions Financial Corp., and Singer Sewing Company. Rick Gould of SGP Worldwide brought this acquisition opportunity to Finn Partners and facilitated the transaction. Finn Partners was launched in late 2011 to realize Peter Finn’s vision to create a leading public relations agency dedicated to shaping a bold new future in which innovation and partnership are strong drivers of the brand. Finn Partners is ranked as one of the top ten, and also as one of the fastest growing, independent PR firms in the US. Finn Partners specializes in the full spectrum of public relations services, including digital and social media. The firm’s specialty areas include technology, consumer, travel and lifestyle, education, CSR/Social Impact, arts, health, and public and corporate affairs. Finn Partners was named “Best New Agency” in 2012 and “Best Agency to Work For” in 2013 by the industry’s Holmes Report. Headquartered in New York City, the company has approximately 450 employees, with regional offices in Chicago, Detroit, Fort Lauderdale, Jerusalem, London, Los Angeles, Munich, Nashville, Paris, San Francisco and Washington D.C., and has Asian and additional international capabilities through PROI. Find us at www.finnpartners.com and follow us on Twitter @finnpartners.